With its much wider flavor range than wine, craft beer is quickly being recognized as a potent pairing partner for that other favorite fermented food. Like craft beer, artisanal cheese is an affordable luxury with price points that make it accessible to just about anyone. While there are no hard and fast “rules” for pairing cheese and beer, and many pairing suggestions from experts are driven by personal taste, these suggestions are always a great place to start when thinking about your own pairings. Here, we asked cheesemongers Cody Cook and Travis Hines of Fort Collins, Colorado, cheese shop The Welsh Rabbit for their recommendations on successful beer and cheese pairings. The first thing to consider when pairing cheese and beer is the same principle that holds when pairing any food with beer—match the intensity of the beer with the intensity of the flavor of the cheese. The flavor curve of cheese tends to be the inverse of beer—while beer oxidizes and typically mellows in intensity as it ages, the flavors in cheese tend to become sharper, funkier, and more focused as cheese matures. Lighter beers, such as pale lagers or wheats, pair very well with lighter fresh cheeses such as fresh mozzarellas/burratas or chèvres. Strong beers such as Belgian quads, imperial stouts, and barleywines can stand up to older, more pungent cheeses. Just as in other foods, look for notes in the beer that complement the flavor and texture notes in the cheese. To complement, try pairing a young, nutty Gruyère with a malty German bock or dunkel or a manchego with an American brown ale. For a contrast, Cook suggests pairing the funky barnyard notes of an Irish Durrus with the sweeter notes of a honey saison, allowing the sweeter notes of honey in the beer to balance the intensely pungent cheese. “When looking at complements or contrasts, don’t just think about taste, think about texture as well,” says Hines. Blues from different cheesemakers have different characters, but one of Cook and Hines’ favorites is the toffee and caramel notes Point Reyes Bay Blue. “Stouts and blue cheeses are just the perfect marriage. The salty and creamy experience of the cheese melds so well with the sweetness of the stout,” says Cook. “I’ve enjoyed this with a hazelnut stout, and it was a beautiful pairing.” Sweeter stouts such as oatmeal or chocolate stouts will typically pair better with these creamy, salty blues than intensely bitter or roasty stouts. For drier, less salty blues, Cook enjoys dry stouts. Roastier stouts pair well with heftier blues such as Stiltons. “A stout and blue is the perfect dessert course for me,” Cook says. Learn the secrets of a perfect pairing menu and find dozens of favorite regional recipes made with beer in Craft Beer & Brewing’s 2015 issue of _Cooking With Beer. _Order your copy today! Beyond cheddar, IPAs pair well with high fat content cheeses (the bitterness of the hops helps cut through the fat), and some suggest pairing IPA with spicy pepper cheeses or blue cheeses. Other fresh, light cheeses such as fresh mozzarellas pair well with the same beers—wheats, wits, and pilsners (as well as similar styles such as kölsch). Try a cheese you like with several different beer styles to get a better sense of how the range of flavors in the beers each work with that cheese. Or take a beer you enjoy and try a few different styles of cheese with it. We use this strategy with our own pairing here at Craft Beer & Brewing and will frequently open several beers with several cheeses and mix and match to find the pairings that work best. The pairings we think will be successful often end up being the group favorites, but just as frequently we find individuals who prefer an alternate pairing. Certain aged beers, like fine aged wines, should not be paired with cheese or food. With complex bourbon barrel–aged imperial stouts and barleywines, aged fruit lambics and guezes, and older Belgian quads, the experience of discovering the depths and layers of the beer can be overshadowed by pairing. These are best enjoyed with a clear palate, as they do not benefit from pairing in the same way that younger beers do. 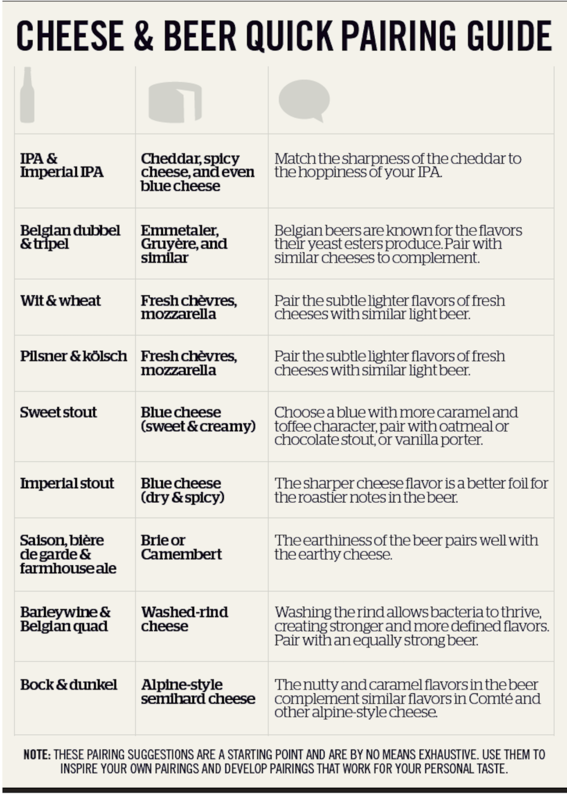 Here’s a handy cheese and beer pairing guide. Turn a duet into a perfect “brew-et” with these tips on how to select the right craft beer to accompany any dish.